Hera, Queen of the Gods, is a complex and regal goddess. She is the patroness of women, marriage, and family, but she is also much more than that. Hera has overseen many great events in mythology and has used her power to shape the path of history. The Queen of the Gods can influence anyone, even other divine beings. The Queen of the Gods is powerful and wise. Her Mythology is filled with vengeance and jealousy, but these are traits that she is trying to overcome as she becomes more of a leader. The Iliad shows her as cunning and tactful, yet motivated by envy. She executes an elaborate plan with the goddess Athena to cause the downfall of Troy, encountering many other Greek gods in the process. For each situation she navigates, she either convinces others to help her, manipulates and betrays them, or send her subjects to enforce her desires. Hera constantly defies Zeus in mythology. In the world of SMITE she is even more free to seek her own place of power. This will not be an easy task, as other gods are critical of her. She has been absent from the Battleground for so long and she will need to rely on her diplomacy skills and displays of power to prove her worth. Hera keeps her jealousy and vengeance suppressed as much as possible and she rises up the ranks. However nobel her actions may be, these emotions constantly lurk below the surface, providing her with the a dangerous ambition to be the best. Hera's primary artistic goal was to convey absolute royalty. We wanted to make a goddess that not only looked like a divine being, but rather like a ruler over divine beings. The art team incorporated her iconic symbols, like the peacock feathers, and combined it with different types of royal items, like crowns and robes, to achieve this aesthetic. We avoided any dark coloration on Hera's clothing, and focused on the beautiful teal/blue of the peacock, accented by white. We found the right crown that felt regal, yet still fashionable. We added more jewelry and extravagant accessories to her to make her status even more visually apparent. We also decided to pair Hera with another character. This would help differentiate her visual appearance and her playstyle within SMITE. A character named Argus is referenced as being under Hera's command in the myth of Io and Zeus, and after a brief look into his mythology we decided he would be the perfect partner. Argus is described as a giant covered with eyes. He is a primordial being and a powerful fighter. In his myths, he even slays the Queen of Monsters, Echidna! We wanted to take a unique approach to Argus and find a look that would pair well with Hera. We asked ourselves: What would the bodyguard of the Queen of the Gods look like? What would this elegant queen want her loyal protector to look like? We landed on an entity made of white marble, gold, and bronze; more of a golem or construct than a creature. We did a few iterations on his shape and size, while always keeping the theme of "eyes" in the visual design. We really liked the four rotating Human faces concept for his head and paired it with a body that is humanoid and top heavy. We avoided the elements that made him feel too techy or robotic. We gave him hands but no weapon. We added more subtle eye symbols all over his armor and body, and used faces as a way to show even more eyes in a different way. Hera's kit focuses on leadership and tactics. She is designed as a Mage that can work well from range, but have limited options to protect herself. She has low mobility and will need to be careful of letting enemies get too close, especially if certain abilities are on cooldown. Experienced Hera players will be able to influence the battleground with constant damage and crowd control from a safe range. Hera has no dash or leap, and even less ways to reduce incoming damage than Baron does. She also has no natural way to heal herself. Because of these features, her primary damaging ability is strong for wave clear and is on a low cooldown. Hera also has other strengths to make up for these weaknesses, like her ability to polymorph enemy gods and, of course, her ally Argus. Argus takes her gameplay to a whole new level, letting skilled Hera players shine even more. An ultimate level pet can be more difficult to manage than something like Skadi and Kaldr, but even more rewarding when done correctly. Because of Argus, Hera excels at securing objectives and structures by providing an additional tank to your team, which has more interesting applications than the traditional mage that supplies only burst damage. 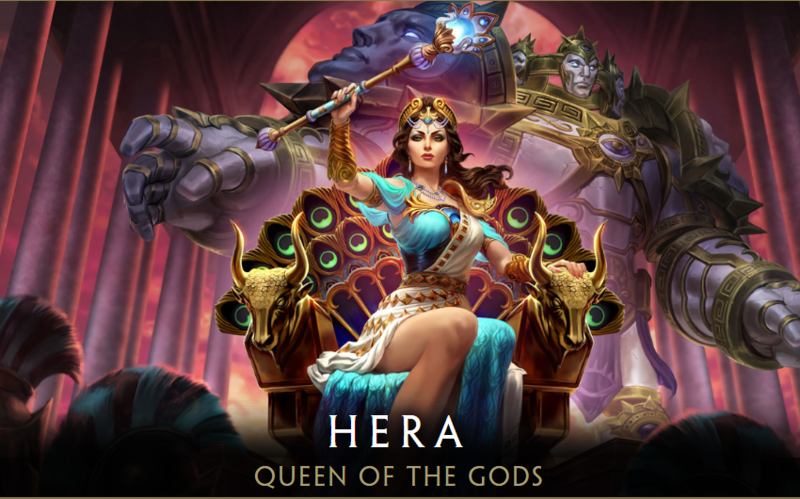 Hera has long awaited joining SMITE, as have her fans. 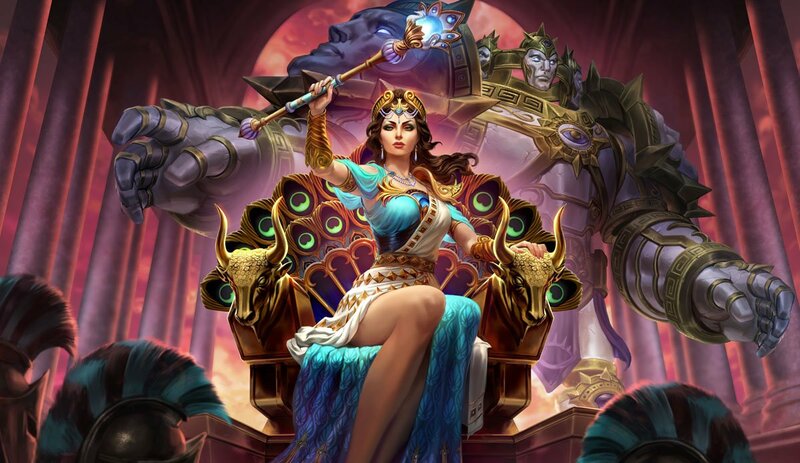 The Queen will be a major part of the game going forward, especially in the official SMITE storyline told in the current event: Hera's Odyssey and in her unique gameplay featuring Argus!